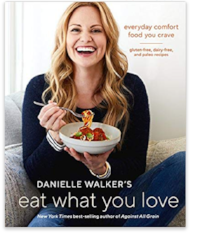 Danielle Walker’s cookbooks have provided countless recipes for Shelly’s kitchen, dinner table, and family. to be released on December 4th! With Danielle’s recipes I am confident my meal prep will be rewarded with praise from the family. This one did not disappoint. They all loved it! Right away we declared that this impressive looking dish was worthy to be served to guests. It was simple and beautiful and I was proud to serve it to my family last week. My husband has requested it again this week. I weekly serve seafood because of its nutritional value and now I have another ace in my pocket with this recipe. Surprisingly it only took 40 minutes to prep and bake. I can imagine prepping it ahead of time and then asking my teen to assemble and bake. After one trial run together, he independently could have dinner on the table for the family, worthy life skill. The ingredients are staples in my home so I don’t have to plan too far in advance. When attending an excellent cooking class in Saratoga Springs several years ago I learned to not give up on a recipe even if I don’t have every ingredient in stock. Other root vegetables or fish can easily be substituted. And don’t let the length of the ingredient list deter you from trying this recipe out, there are many spices that make it seem long. So pick up a salmon fillet next shopping trip, you won’t regret it. Whisk together the honey, mustard, vinegar, and oregano, 1/2 teaspoon salt, and 1/4 teaspoon pepper in a small bowl. Place the salmon fillet in a baking dish and pour the marinade over the fish. Marinate for 15 minutes. Meanwhile, in a large bowl, toss together the butternut squash, brussels sprouts, tomatoes, oil, lemon juice, garlic powder, onion powder, oregano, turmeric, 1/4 teaspoon salt, and 1/8 teaspoon pepper. Scatter the vegetables around the outer edges of a large rimmed baking sheet. Remove the salmon from the marinade, allowing any excess to drip back into the baking dish. reserve the marinade. Place the salmon in the center of the baking sheet and arrange the lemon slices on the top of the fish. Make It Ahead: Store the prepped vegetables in an airtight container in the fridge for 3 days. Store the spices in an airtight glass container in the pantry for 6 months. Tidbits: To make this NSF, omit the tomatoes. Almost every ingredient in this recipe can be bought at Aldi (an affordable grocery store). ONLY use PURE honey (or substitute: pure maple syrup). Mustard sauce from the fridge worked easily for me. TURMERIC is very helpful for reducing inflammation and joint pain. I have worked with runners that need to regularly consume turmeric or they start having knee pain. Use Lakewood Organic Pure Lemon Juice from a jar and stored in the fridge. I seem to never have fresh lemons when I need them so Danielle Walker suggestion in the past has been to use lemon juice stored in a jar. It is a realistic and helpful short cut. My fillet was on the large side and I didn’t have enough extra marinade to drip off and brush on the salmon and it worked out just fine. I use a super large rimmed Wilton baking sheet, it is almost as wide and deep as my oven. Last weekend I picked it up at Joann’s Fabrics on sale for $10. My salmon baked a few minutes longer than the recipe suggests. But my oven has a mind of its own and I just kept a close watch for when the salmon had a flaking texture. Cooking Class Lesson - Don’t over cook seafood!